Play Along with 22 Great Songs and Instrumentals! Play Along with 22 Great Songs and Instrumentals!. Homespun Tapes. 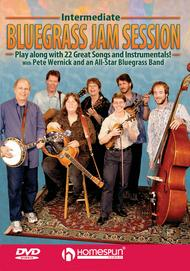 Play Along with Pete Werncik and an All-Star Bluegrass band. 22 Great Songs and Instrumentals. Bluegrass, Instructional and Play Along. Instructional video: DVD. With lyrics and chord names. Duration 120m. Homespun #DVDWERJM22. Published by Homespun (HL.641950). ISBN 1597731315. 5.5x7.5 inches. Taught by Pete Wernick. This continuation of Pete Dr. Banjo Wernick's popular series features a professional bluegrass band providing back-up to favorite jam session songs. Beginning to intermediate players will get the practice they need to join in the fun.